Local Kiwi casino firm, SkyCity Entertainment Group Limited, has reportedly announced that it will be launching an iGaming service by year end. Considering such operations are currently illegal in its home nation, the firm is facing official opposition form New Zealand Prime Minister, Jacinda Ardern. According to the New Zealand Herald newspaper, SkyCity’s Communications GM, Colin Espiner has revealed that the service will probably be hosted in Europe, in lieu of the fact that most online gaming ventures are based there, and that it will most likely be run by a subsidiary in association with an already established tech partner. In the hopes of deflecting any criticism, Espiner announced that his firm intends to donate up to $27 million a year to the NZ government via a voluntary goods and services tax. Should this be refused, it was purportedly disclosed that the cash would then go to the company’s own trust program. Ultimately, Espiner divulged that his firm expects the start-up costs for such a venture will likely yield little to no profit in its first year, but that any later proceeds will be repatriated and subjected to local taxes. MONOPOLY Live is on its way! LeoVegas is excited to announce that it will be one of the first operators to launch MONOPOLY Live from 28 March 2019, and it will be available 24/7. The game, created by Hasbro and Evolution Gaming, is an online version of the classic Monopoly board game, combining elements from Evolution’s Dream Catcher to spice things up. 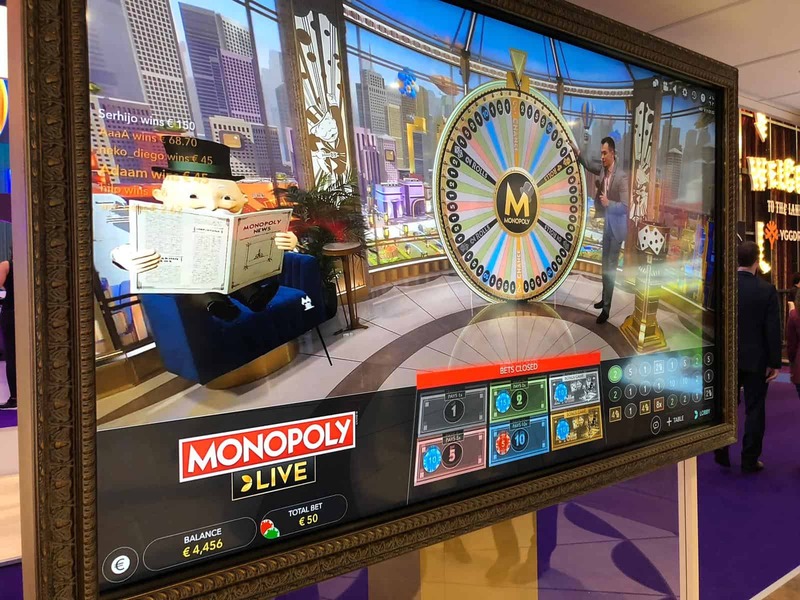 MONOPOLY live will feature Evolution’s money wheel that includes “CHANCE” segments for instant wins and multipliers, and players can also activate the exciting 3D MONOPOLY bonus game where they can collect great prizes. Super Sic Bo – an exciting variant of the classic dice game enhanced with random multipliers. Available from 11 April. Deal or No Deal – based on the popular TV Show, set for release in May. Microgaming’s progressive jackpot network continues on a high in 2019 with two lucky players landing massive wins while playing the highly popular Mega Moolah slot. On Tuesday 5 March, an astounding USD 12,945,668.34 jackpot was hit, followed by a CAD 3,308,063.71 jackpot win on Wednesday 6 March – the latter having been triggered within 33 bets of the player registering with the casino that day! Both lump sums were won through Casino Rewards brands. The USD 12+ million payout marks the fourth largest on Microgaming’s progressive jackpot network, following the CAD 20,059,287.27 win earlier this year. Having so far paid out more than $1 billion to date, Microgamings’ progressive jackpot network is firmly the largest of its kind in the industry, and have made more than 71 players instant millionaires. Could you be next? Try your luck here! You are still in time to enter the Wish You Were Here campaign at LeoVegas, and stand a chance to win a trip of a lifetime, cash prizes or free spins worth $70,000. The promotion runs until the 24th of February. All you have to do to take part is to deposit and play the selected Casino and Live Casino games. There are three parts and three tiers depending on the amount you deposit and wager. Week one starts on 4 February and lasts until 10 February, week two runs between 11 and 17 February while the final week starts on 18 February and ends on 24 February. Tier 1 requires you to deposit and wager a minimum of $20 for a chance to win free spins and Live Casino bonus drops. Deposit and wager a minimum of $50 to make use of Tier 2 for a chance to win a cash prize. If you deposit and wager a minimum of $100 during the promotional week, you can win a dream trip worth up to $10,000. What is up for grabs? Tier 3: One player will win a trip of a lifetime every week. When it comes to a trip of a lifetime, winners will be able to choose dates and destinations as well as their guest. They can also claim a cash alternative of $10,000. Crowned as the "King of Mobile Casinos"
Thanks to ever-improving technology and innovation, 2018 had no shortage of top-quality slot games, with leading software providers scrambling to out-do each other. Of these, let’s re-cap the top 10 slots that Kiwi players indulged in during the last year. Note that all the mentioned games are available to play across all formats. 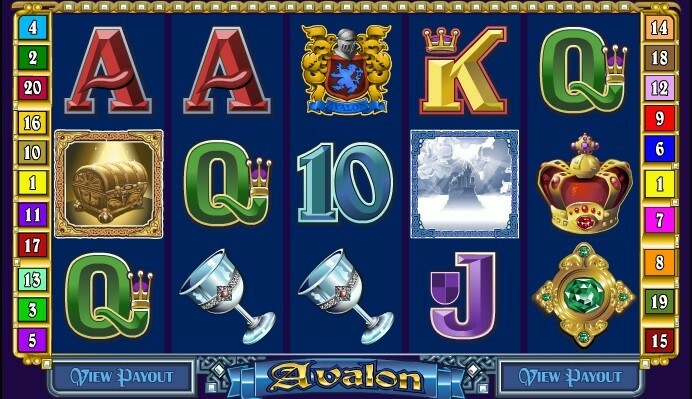 Avalon is a classic 5-reel x 20 payline Microgaming video slot that just seems to get better with age. Relive the story of King Arthur and the Knights of the Round Table told through lovely graphics with an enchanting soundtrack. Bonus features include free spins with multipliers up to 7x as well as a bonus gamble game for a 2x or 4x win. Best of all, this medium-variance slot comes with a 97% RTP and a max jackpot of 105,000 in cash! Visit the golden City of Fortunium for bountiful wins in this 5 x 5 x 40 payline Microgaming / Stormcraft Studios release with a steampunk feel. Fortunium is well crafted, offers great features – check out the Win Booster option especially, and comes with an RTP of 96.47%. Powered by Microgaming software, Mega Spin Break Da Bank Again is a multi-panel slot machine sequel to the ever-popular Beak Da Bank. Following the same heist theme, you have 5 reels and 9 paylines of tight security combinations to break through, to ultimately unlock the bank vault and get away with wins up to 375,000 coins. Cool Buck is a Microgaming slot with 5 reels and 9 paylines. Gameplay benefits from super stacked wilds in both the base game and Free Spins feature – where you can get up to 30 free spins. Furthermore, all wins during the free spins round are doubled. Cool Buck is a low variance game offering wins up to 2,388x your total bet on each free spin. Agent Jane Blonde is a simple Microgaming slot with 5 reels and 9 paylines. The classic spy-themed game comes with a wild that doubles payouts, as well as a Free Spins feature that awards up to 30 free spins with a potential 6x multiplier (with the doubling wild). It is a medium variance game with the potential to reward you with 3,407.11x stake on each free spin – provided it includes the doubling wild (as you’ll benefit from a 6x multiplier). Base game wins can go up to 1,140.44x your stake. Asian Beauty is a 5-reel x 243 ways Microgaming video slot with a pleasant Oriental theme. The game is packed with win-boosting features, including wilds, scatters, a free spins bonus game and a Mirror bonus game yielding up to 9,000 coins, which is triggered randomly. King Tusk is a 5-reel, 25-payline slot from Microgaming and, as the name suggests, it’s all about majestic African Elephants. Features include a wild that can randomly expand to give you a wild reel and 3 to 20 free spins – each with their own wild feature. King Tusk is a low variance slot but the wins are pretty frequent and decent at up to 992x your stake. Thunderstruck II is a 2010 Microgaming release that centers around Nordic legends Thor, Odin, Loki and Valkyrie. It is a 5-reel x 243 ways slot game that offers you up to 8100x your original bet when the bonus features come into play. Set sail and experience the joy of discovering new lands in Microgaming’s 5-reel x 25 payline Age of Discovery slot. This popular slot offers features such as a wild, two scatters and a Treasure Bonus game. The scatters offer 5x, 20x and 80x multipliers – which on a max bet of $125 means you can win up to $10,000 per spin and a possible max jackpot of 60,000 coins. 2018 was a spectacular year for some lucky punters as Microgaming paid out a record-breaking sum in life-changing wins. That’s a mammoth €154,954,249 to be exact! No less than nine players took home seven-figure sums equating to more than €40 million. The first noteworthy win was triggered on the 14th of January, when a handsome cash prize of €2,424,117 was paid out to a Zodiac casino player. The next mega win of €4,769,344.11 was awarded to a Royal Vegas casino player in February. Only nine days later another mobile casino player became a multi-millionaire on the 8th of March by winning €4,365,843 on Captain Cook’s Casino. Grand Mondial Casino produced an instant millionaire on 19 April thanks to Microgaming software when a fortunate player took home a cool €4.6 million. Jackpot City paid out the next massive €4,931,205 prize on 24 June. The biggest win however, occurred on 28 September via the Mega Moolah progressive online slot, when a player landed a gob-smacking €18,915,872 payday via his mobile device. This win also broke the Guinness World Record for the “Largest jackpot payout in an online slot machine game”, previously held by another Mega Moolah player who won €17,879,645 back in 2015. Microgaming’s Safari-themed jackpot slot produced six millionaires in 2018, proving yet again to be a fan favorite, with definite prospects of more record-breaking wins in 2019. At the time of writing, the latest jackpot has already surpassed the €18,000,000 mark. As you can probably guess by the title, Playtech invites you on a cosmic journey in the 4×4 reel, 20 payline Galactic streak online video slot. Explore vast galaxies, complete with planets and sparkling stars, while soothing sounds caress your ears. And along the way you can collect re-spins and multipliers on each and every spin. The burning sun symbol is wild, and stands in for all the planet symbols to help you create wins. It also produces the highest payout should you be lucky to land four within the 4×4 structure – a colossal 125x your stake! This symbol also locks into place once it appears, which greatly increases your chances of getting more wins on the next spin. Every spin reveals Stellar Multipliers, so you can earn yourself multiplier values whenever you hit a win during the base game. The symbols involved in the winning combination will have a x2 multiplier value attached to it. The multiplier value will continue for the duration of three spins, and can potentially increase to x10 if you are lucky enough to land winning symbols consecutively on the same payline. The pink & white galaxy scatter triggers the Galactic Free Games feature when a minimum of 3 show up on the reels. 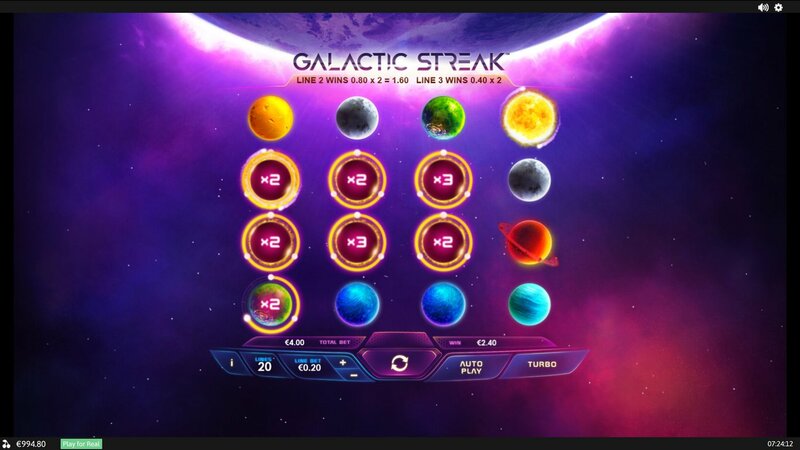 Once activated, you will receive 10 Free Spins and the multiplier values that you stored up during the base game comes into play here too to unlock even more astronomical wins. You have an array of convenient betting options even though the slot is limited to 20 fixed paylines. You can choose between eight different line bet denominations, ranging from $0.01 up to $2.00. This translates to a minimum bet of $0.20 per spin, and a maximum bet of $40.00 per spin. Spend 5 Nights Under the Magical Northern Lights, Courtesy of LeoVegas Casino! Ever wanted to visit Santa’s Hometown? Well thanks to the good folks at LeoVegas you can! As part of their festive celebrations, LeoVegas is sending two lucky players on all all-expenses paid trip to the wonderland that is Lapland. This promotion starts on 10 December and will last until 1 January, and the winners will be randomly drawn on the second day of the New Year. New players simply have to make a minimum deposit of £50 and also wager the deposit in the LeoVegas Live Casino or LeoVegas Casino. You can play any game your heart desires, and one wager of £50 gets you one entry into the raffle. Earn as many as you like! The two lucky winners and their respective partners will be sent to the breath-taking Kakslauttanen Arctic Resort in Lapland. There they will spend five nights in igloos that are glass roofed, meaning they will be able to see the stars they’re sleeping under, and have the awesome opportunity to witness the Northern Lights in all its splendour! In addition, the players will also be able to pick several activities during their stay. There is a total of six activities, including a husky safari that lasts for four hours, going on an Aurora hunting while driving on a sleigh drawn by horses, Nordic skiing lessons, driving snowmobiles and seeing reindeers and much, much more! To learn more about this amazing offer, including the all-important terms and conditions, visit LeoVegas in the link below. This month has seen a range of fantastic new slots to keep us glued to our screens, it almost feels like Christmas has come early! All features games can be tested for free and are available as mobile slots too. Welcome to a new breed of game, featuring an industry-first in character animations – real time 3D rendering. Add to that an intergalactic storyline with two titular characters; Lyra and Erion at the helm. Astro legends from Microgaming is a cluster type game with a diamond shaped reel design that employs innovative features for unique gameplay, underscored by fantastic bonuses and entertainment that is literally out of this world. Exciting bonus features include the Sonic Respin feature that can create massive wins when the cluster grows, and the Lyra Spirit bonus, which is essentially a pick’em game that takes the gameplay to a whole new level. Crystal Rift is an expedition themed slot from Microgaming that offers players the chance to unearth precious crystals blown out of the rock. It is a Cascading Reel Slot with 25 fixed paylines and features engaging game mechanics and stunning visuals. Bonus thrills await in the Wild Grid feature where all enclosed symbols are transformed into Wild symbols after landing 3 wins in a row. There are 20 different grid patterns which are divided into four strength classes, each delivering its own level of excitement and variety. With the combination of the Bonus Falls feature in play, explosive chain reactions are guaranteed allowing you to uncover as much treasure as you can lug. It’s all about a wild talent show with Microgaming’s 5-reel x 20 payline Reel Talent slot. Bonus features include Re-spins, Symbol Storage and Superspins, while a group of fierce performers vie for the centre stage. In the Symbol Storage feature all winning symbols are stored and a Re-spin awarded. When you store three winning symbols, you get a Superspin that is made up of three different levels and contains only the stored symbols. For three different symbols, you’ll be awarded the Showtime level, two different symbols award you the Big Stage level, and should all stored symbols match, you get a shot at the Solo Performance level where you are guaranteed to win big! Push Gaming introduces Icy Gems, a 5-reel slot with 20 paylines that feature Re-spins, Symbol Storage and Superspins. It’s a no-frills game with a simple layout that is easy to master. Every winning symbol is stored with the Symbol Storage feature and a Re-spin is awarded. You will be awarded with a Superspin when three symbols are stored. The Superspin has three different levels and only contains the stored symbols. Three different symbols award the Silver level, two different symbols award the Gold level, and if all stored symbols are the same, you get the Big level where great payouts are guaranteed!